Spring Garden Park is unlike any park you've ever seen. But it doesn't come cheap. Needed improvements drove the price tag above four million dollars. Where in Southwest can you find a bamboo-woven hut, a play-structure roof that pinpoints constellations one night of the year, interactive fountains, a "Where the Wild Things Are" natural area and two sets of chimes? Anyone living in the neighborhood around SW Spring Garden Street and SW Dolph Court near Barbur Boulevard and SW 30th, knows where. Welcome to the new, wildly popular, Spring Garden Park. In early fall, the park's designer and project manager, Travis Ruybal, gave a tour of the 4.25-acre park. The acreage includes a steep hillside sloping north. From the top on Dolph Court to bottom at Spring Garden Street, the park descends the height of a seven-story building. And the slope had been well known for oozing with seasonal springs and flooding houses near the base. That could be the origin of the name "Spring Garden," Ruybal suggests. So, he and his had issues to face, and they would come at a price. Major earthwork and surrounding improvements, like new sidewalks, brought the cost to $3,125,000.00 for the Park Development and $1,200,000.00 for the street improvements (Total Budget = $4,325,000.00). Portland Parks and recreation had bought the open space from Portland Schools back in 1999. In the intervening years, the parcel was used mostly as a dog romping ground and pleasant viewpoint. Ruybal said that in the year-long public process of deciding how to develop the park, the dog-owners at first were a major voice. Over time, however, young parents spoke out about the needs of kids in the area. It was decided as part of the public process that the park couldn't accommodate both kids and dogs. The dog-owners could use Gabriel Park's ample dog runs instead. Working with Friends of Spring Garden Park, Ruybal and his team explored the park's potential for children. "You kind of have to be a kid yourself when you do this," said Ruybal. But not the kid you WERE. "Playgrounds have come a long way since the '90s,"
One of the biggest changes was recognizing that kids, many of whom are not getting the exercise they need to be enticed. Spring Garden Park, while it has traditional swings and play structures, is full of inviting challenges. The slides require an uphill scramble, there are a few "risks" available. Try balancing on the elevated (but not too elevated) trail of logs, which lead to "scramble stones" leading to an elevated pathway and the slides. Rope webs worthy of monster spiders beckon maze-intrigued children. A spraying, spouting water feature promises a moist romp on a hot summer's day. Behold other new-fangled stuff like "Euro-twisters," and "Bobble Riders" and spinners and the cage-like observation tower with its constellation-revealing roof. Take in the odd spherical, bamboo-woven "Nest" hut by artist Hannes Wingate, famous for his "Big Bird"-worthy dwellings. 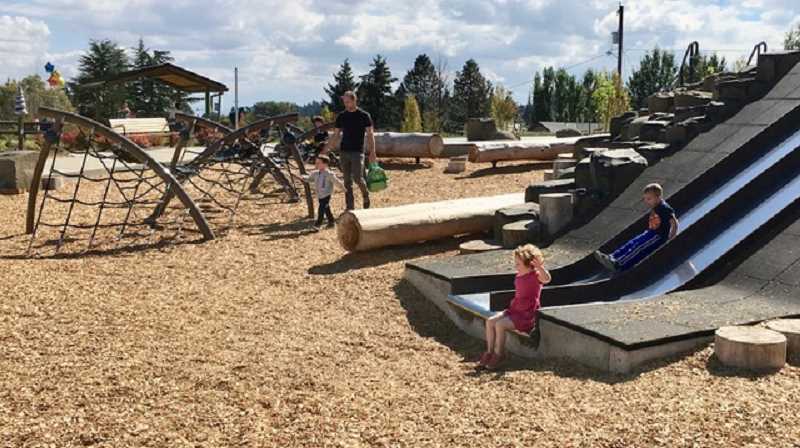 Conveniently enough, the kids' play area features a state-of-the-art toilet, a drinking fountain, benches for watchful parents and grandparents and a covered picnic area. But this is just at the top of the park. Amble down the slope on a paved path with Ruybal. The path's gentle switch backs make the entire park accessible to all. If need be, an ambulance can use the wide path. The hillside is the source of that oozing, wet-weather water. Ruybal points out that the hillside now has subsurface drainage pipes to redirect storm water. A filter fabric prevents erosion. The sloping meadow has been planted with wildflowers so that in the spring, the hillside is alive with color. This is a "Spring Garden" in more ways than one. At the base of the hill is a small amphitheater as well as a wilderness marsh where the north fork of Tryon Creek has been daylighted. Ruybal compares the catchment basin to "Where the Wild Things Are," and, indeed, when we peered into the thicket, an orange tabby cat stalked the wilds for prey. The park, not even a year old (it opened in June), has had inevitable growing pains. A line of newly planted trees on the northern boundary died in the summer's heat and will be replaced. Adventuresome kids have discovered unanticipated "adventures." Like skate boarding on the roof of the observation tower and shoveling gravel from a path to another play area (that problem was solved by adding a binder to the gravel or tearing off bamboo from Wingate's hut (the strips, it seems, make great whip-like swords). Ruybal cautions that the "Wild Place" marsh has yet to be tested by winter's stormwater run-off. For all that, if snow comes, the meandering path will invite sleds and toboggans. Spring will carpet the hillside with wildflowers. And summer....well you never know how kids will make the park their own then. But they will. And, whatever the season, we "older children" will share the joy of their delight.